Eoghan Clifford will wake up one happy, but sore, man today. Clifford with members of his family. WHEN THE SEARING pain streaking down his leg subsides a little later, Eoghan Clifford may then finally be able to fully appreciate the magnitude of the achievement of winning a Paralympic medal. The 35-year-old left everything out on the Velodrome track last night, pushing through the pain barrier to secure bronze in the C3 Individual Pursuit. Whether or not he was able to enjoy the medal ceremony immediately after is another matter, with the Galway cyclist visibly distressed after coming off the track. 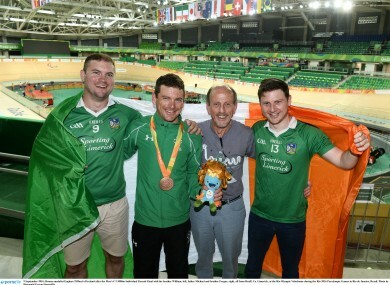 Even the adrenaline rush of winning Ireland’s second medal of the Games couldn’t ease the pain. “I didn’t really win that because I’ve better legs, I was in agony from the start with my knee and stuff, I won it because I felt I would let so many people down if I didn’t medal today,” he admitted. After squeezing through Friday’s qualifiers, Clifford — who only took up the sport two years ago — then managed to defy the pain in his knee to carve out a significant enough buffer for him to hold on across the line. It is an injury which hampered his preparations for this event and, unfortunately, during it. At full fitness, Clifford may have had the capacity to finish even higher on the podium. Even still, to show such character in a state of great discomfort and muster the resolve to keep going when it would have been so easy to pack it in epitomises the Paralympic spirit. No obstacle will get in the way. “During the race my left leg seems to go numb, it feels like pedalling on one leg, (with) someone stabbing me in the leg, a shooting pain,” he explained. “In training it just meant I didn’t do the same sort of track work as my team-mates. I think it stems from the fact that my lower leg is so wasted. I am generating a lot of power up here (quads) but the transition down through my legs is quite poor so it is putting a lot of pressure on my knee. “I think it is more my condition [muscular degenerative disease called Charcot-Marie-Tooth]. I generate a lot of power in my upper legs. On the rad bike I don’t particularly get the same injury. My condition is degenerative, and in the last few years, the muscle mass in my lower legs has decreased quite significantly. Physically and mentally drained after a long day on the track, Clifford now faces a crucial period of recovery before Wednesday’s C3 road time trial. Upon receiving his medal he could barely find the strength to hold it up to pose for the photographers. So it will be a big challenge to have shaken off the effects of yesterday’s exertions by the time Wednesday’s time trial comes along — but there’s still a lot more to come from Clifford. Email “Galway lecturer Clifford battles through the pain barrier to ensure he 'didn't let anyone down'”. Feedback on “Galway lecturer Clifford battles through the pain barrier to ensure he 'didn't let anyone down'”.